There's been a lot of surveys - online and print - that say French people are snobbish, they are unwelcoming and they are just plainly rude. But despite of that there are still tons of tourists visit and see their country because, for one, who could resist the City of Love and Lights, right? But do you know that there's no need for us to travel that far to feel the love of France? 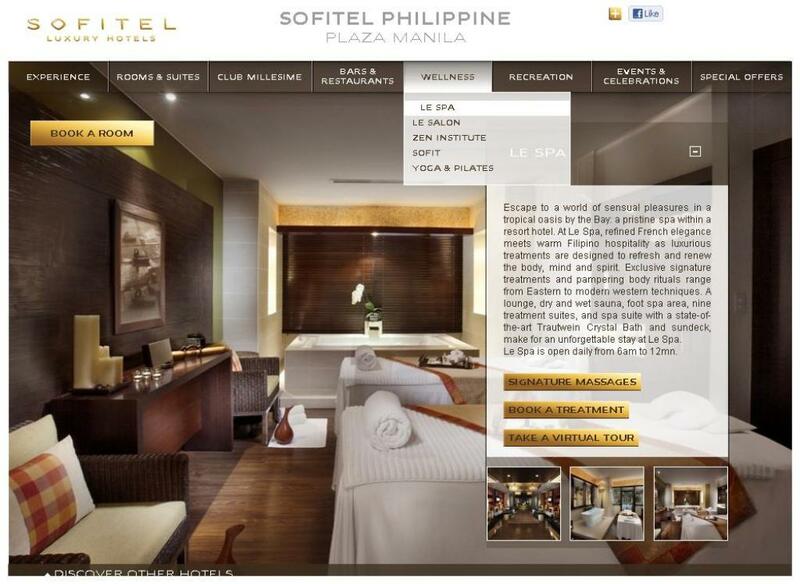 Because right in the heart of Manila lays the "friendly France", and it is called Sofitel Manila. Mixed with the genuine friendliness of Pinoys and lovely beauty of France, Sofitel Manila has been in the country for decades sharing wonderful memories of two countries in one tropical and authentic scenery. 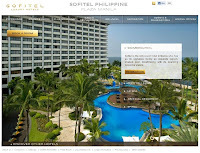 And now as they extend their hands to the world, Sofitel Manila launch their state-of-the-art and highly conventional website that lets you peak into their enchanting yet stylish world, www.sofitelmanila.com. I still haven't got a chance to stay in Sofitel, but I have attended some gatherings here and was able to dine at the very popular Spiral. And with just those two things, I won't deny the French elegance that I'm longing to experience is very addicting here at Sofitel Manila - especially the food! During the website launch, in which I was invited, I was once again wowed by how this classy place takes the competition to a more elegant way. If in fashion they say "I'll be there with my red stilletos", I guess in tourism industry, Sofitel would simply say, "Our beauty is effortless, bring it on!" 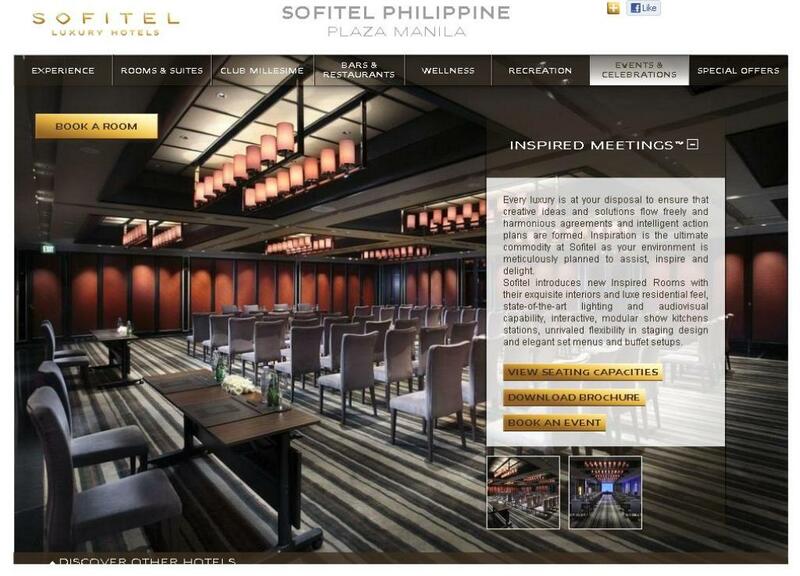 From the stylish and always pleasant-looking designs, Sofitel Manila just brought everything to digital space, which is something that can be enjoyed anywhere in the world. 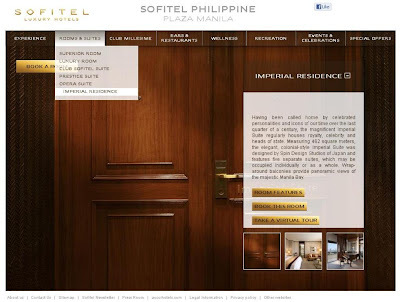 With every click, www.sofitelmanila.com will able you to explore the concise and very exquisite rooms and amenities of this grand luxury hotel in Manila. What's more exciting? It enables every user a 360-degree look of their rooms from the Superior Room, Luxury Room, Club Sofitel Suite, Prestige Suite, Opera Suite and the ever-beautiful Imperial Residence. This Virtual Tour will allow every viewer a quick look as to what's awaiting them if they book a room online. There's also the list of every room amenities for your comfort and easy-access, as well as the dishes that you wanna indulge in. Then, there's also a virtual tour around the Club Millésime, Le Bar, Le Spa, Snaps Sports Bar, Meeting Rooms, and around the property. It was such as breathtaking as in real life, which Sofitel Manila made sure. 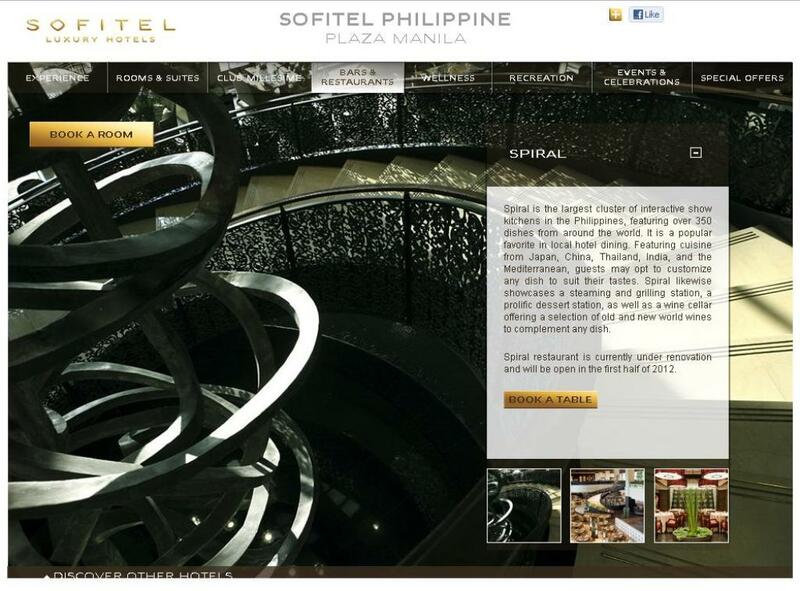 As for the famous Spiral, since it was badly damaged during typhoon Pedring, Sofitel Manila promised to open its doors again some time second half of the year - something to look forward, really! 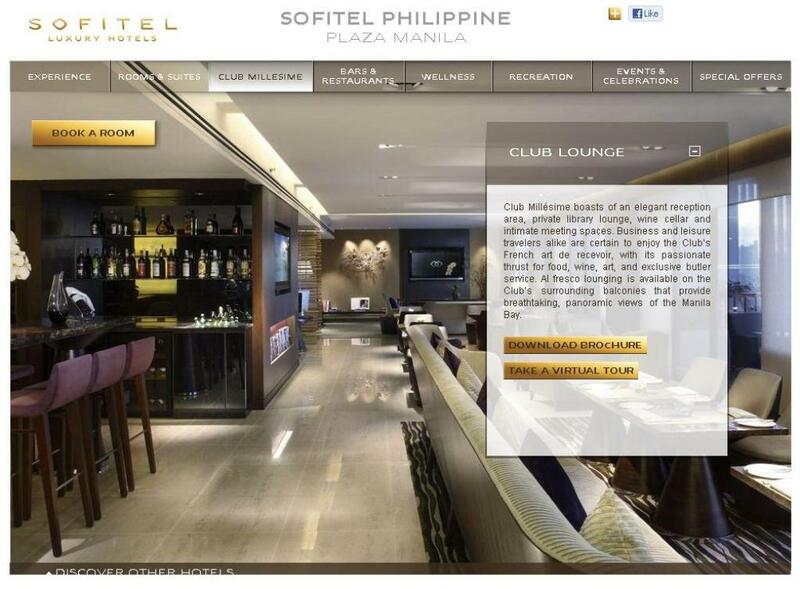 Lastly, here in www.sofitelmanila.com, you'll get the latest and hottest special offers that you can use for your stay at the very friendly France of Manila! 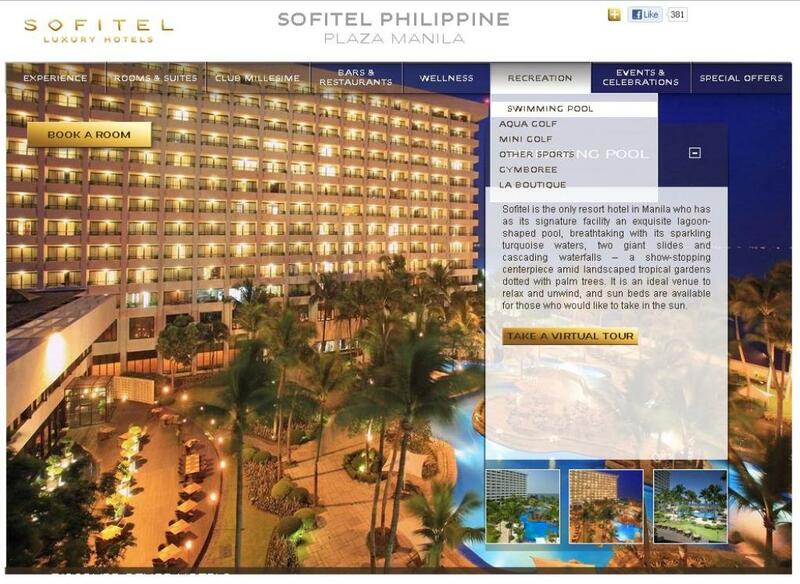 You can also check their Facebook Page http://www.facebook.com/SofitelManila and Twitter https://twitter.com/#!/sofitelmanila for more updates! Now, this is one of the many reasons why Manila is the L-O-V-E! And just like the song says, "You'll coming back to Manila," and that I assure you! I love France but I love Manila more! @El Toro: That's so Tsimis!!! Hahaha! I've been here two times... 18th birthday 'yung first then wedding 'yung second. I stayed na rin for 2 nights... All I can say is... if you want to take a good swim with refreshing drinks by the poolside and beautiful sunset watching.. go to Sofitel... ang dmai pang eye candy! Promise! 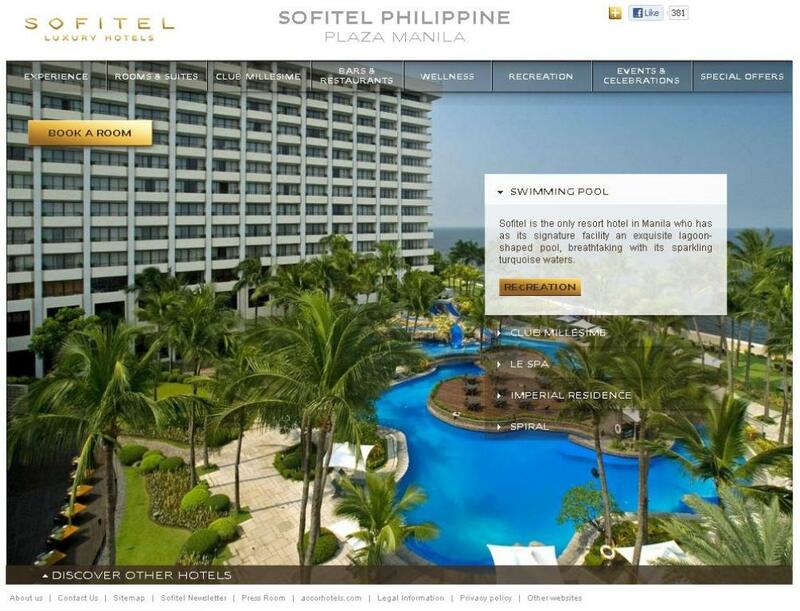 If only we had to money, sa Sofitel kami magpapareception on our wedding day! Super elegant ng facility and the food, I'm dying to try! Alex, hope you win! Tapos libre mo Lola Bloggers! Woooooot! Sofitel's new website is really cool. Very smooth and interactive. The photos they've used is also 'nakakahalina' for sure guests will definitely have the vision of the surroundings while viewing it online.